Although written back in 1911, this book proves that sometimes (and mostly) old wisdom transcends the change and the date that is focused on the character of the individual. 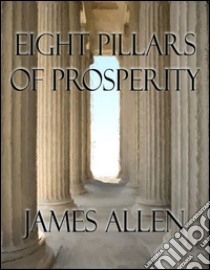 James Allen begins this classic book with these words prosperity rests on a moral basis. Not everyone will appreciate the style of writing of Allen, is, as I have said, written in the early 20th century, however, I do, and I personally love your metaphor for this work being based to build a temple of Prosperity and is eight pillars that support the temple. The eight temples are (1) Energy (2) Economy (3) Integrity (4) System (5) Sympathy (6) Sincerity (7) Impartiality and (8) Self-Sufficiency. Allen writes that "The moral force is the life of all the success, and sustaining element of prosperity." And, as most of the wisdom literature reminds us, it also highlights that there are several types of success and that we need to define what it really means to us, and not in comparison with others ... which of course is perfectly aligned with the inescapable for a prosperous life, depicting the First inescapable truth as defining what a prosperous life for you truths. A business built on impeccable practice of all these principles would be as firm and enduring as to be invincible. Nothing could harm him; nothing could undermine its prosperity, nothing could interrupt his success, or bring it to the floor; but that success would be guaranteed with steadily rising since the principles were respected.